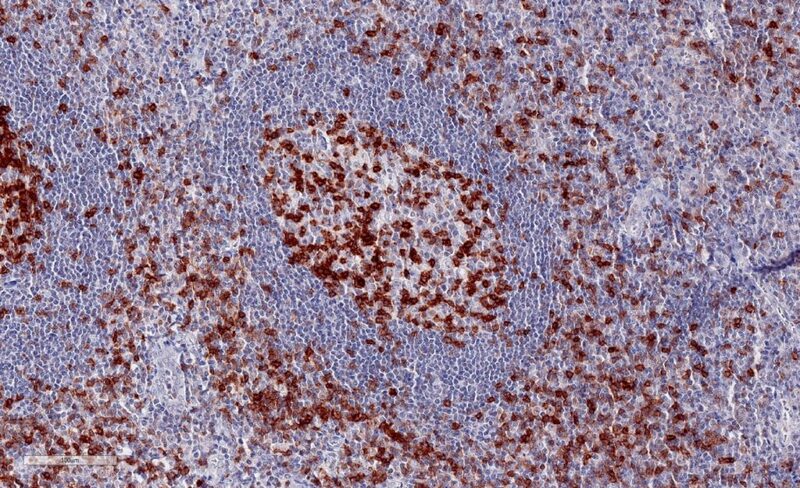 ONCOdianova developes new antibodies for IHC detection of cancer immunology checkpoint biomarkers in FFPE-tissues.ONCOdianovas idea is to integrate immunohistochemistry as early as possible in the hybridoma screening procedure. 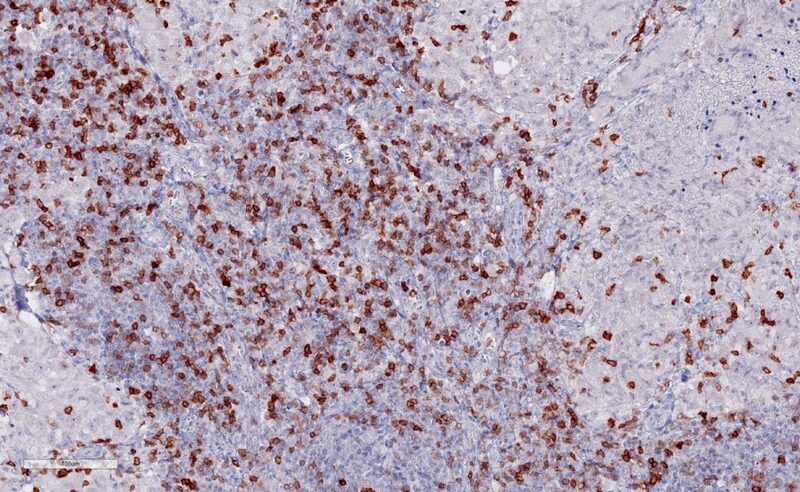 Clone TG1 is the first monoclonal antibody detecting TIGIT (T cell immunoreceptor with Ig and ITIM domains) in standard FFPE human tissue specimen. It has been validated for the identification of TIGIT positive T-cells infiltrating human tumors in order to allow the detection of TIGIT in the tumor microenvironment under pathological conditions. Immunohistochemical application of monoclonal antibody TG1 may provide valuable information for clinical research and potential therapeutic interventions specifically targeting the TIGIT-related tumor immunology checkpoint. 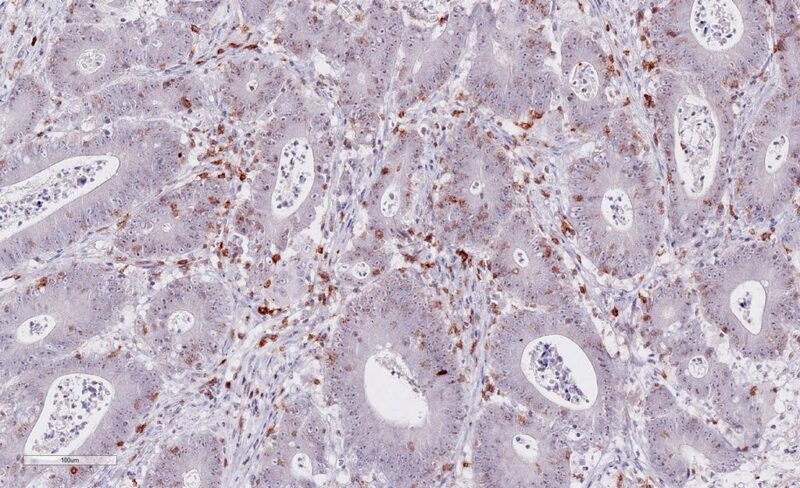 Strong membrane staining of TIGIT-positive lymphocytes in human FFPE tissues with the monoclonal antibody TG1. Each image is shown at 20x magnification. Sections were stained for TIGIT (T cell immunoreceptor with Ig and ITIM domains) antibody using a HRP conjugated polymer system with DAB as a chromogen (brown) and counterstained with haematoxylin (blue). The immunoreceptor TIGIT acts as an inhibitory immune checkpoint on both T cells and natural killer (NK) cells by a highly complexe pathway. Known ligands for TIGIT include CD155, and CD112. The TIGIT/CD155/CD112 network also interacts with other checkpoint regulators (see scheme above). 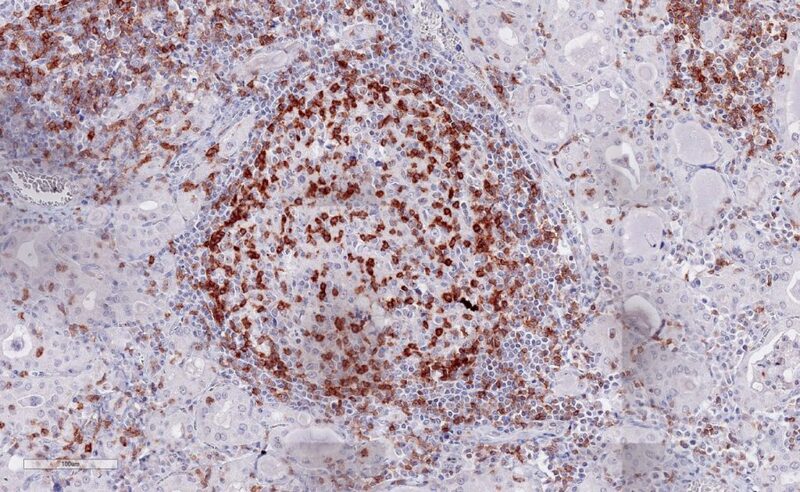 TIGIT expression on lymphocytes is highly correlated with the expression of other coinhibitory molecules, including PD-1. 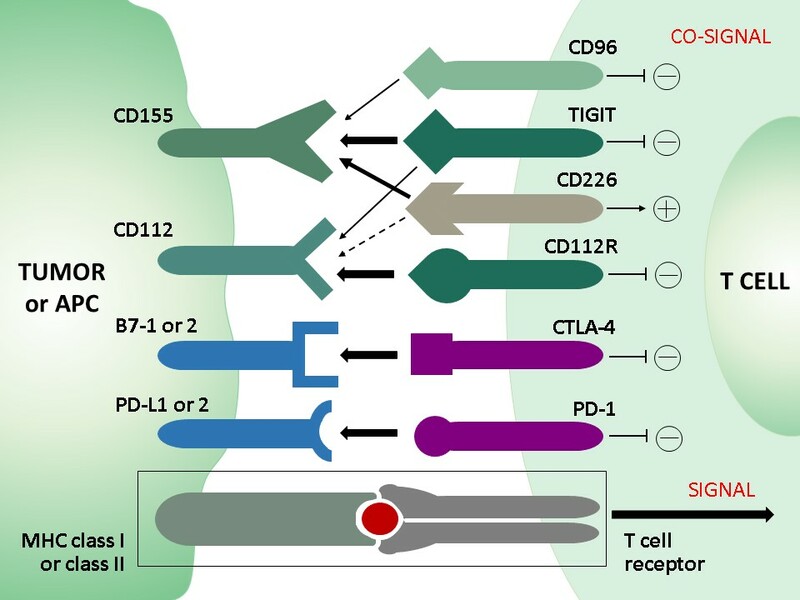 The complexities of the TIGIT pathway upregulated in inflammation and in cancer tumor and its interactions with other inhibitory checkpoint pathways offers opportunities for research and clinical translation. We believe that monoclonal antibodies for reliable and standardized histopathological detection of immune checkpoint targets in tumor tissues will be crucial and indispensable for future studies and diagnostic approaches. Blake SJ et al. 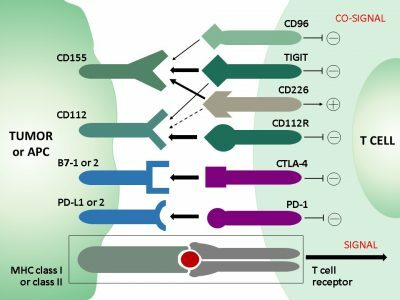 Molecular pathways: targeting CD96 and TIGIT for cancer immunotherapy. Clin Cancer Res. 2016;22(21):5183-5188. doi:10.1158/1078-0432.CCR-16-0933. Grogan J et al. The immunoreceptor TIGIT regulates anti-tumor immunity. J Immunother Cancer. 2016:4(suppl 1):P209. Kurtulus S et al. TIGIT predominantly regulates the immune response via regulatory T cells. J Clin Invest. 2015;125(11):4053- 4062. doi:10.1172/JCI81187. Lozano E et al. The TIGIT/CD226 axis regulates human T cell function. J Immunol. 2012;188(8):3869-3875. doi:10.4049/jimmunol.1103627.